Friday, February 4: This morning JiYoung, the Korean bakery girl, and I rent bikes from the owner of the commune. They are sturdy old-fashioned bicycles with baskets and no gears, the kind I rode when I was a girl. Everyone seems to ride these kinds of bikes in Kyoto. Compact and well-dressed Japanese people pedal around on them, looking unhurried and day-dreamy, creating a simple Japanese-style Norman Rockwell-like ambiance that makes me feel a nostalgic fondness for the days when life was full of straightforward and uncomplicated pleasures. 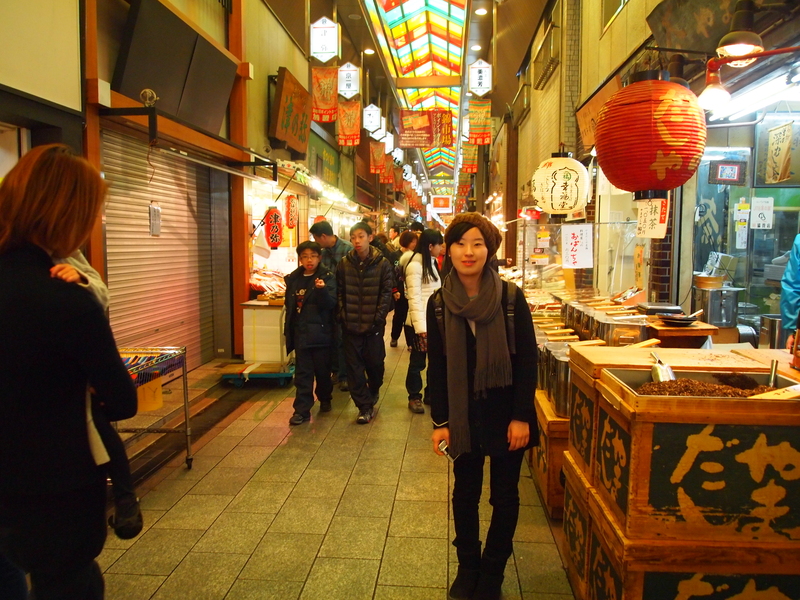 My destination is Teramachi-dori Street, a street of food markets and eclectic funky shops in downtown Kyoto. JiYoung, who hasn’t been out exploring Kyoto that much, is happy to come along with me wherever I go. We bundle up in our warm coats on this dapper day and head along streets that the owner has highlighted in yellow on our map. It’s really not too cold of a day for bicycling, but I’m happy to have my big coat on because of the breezes we encounter as we slice through the crisp air. 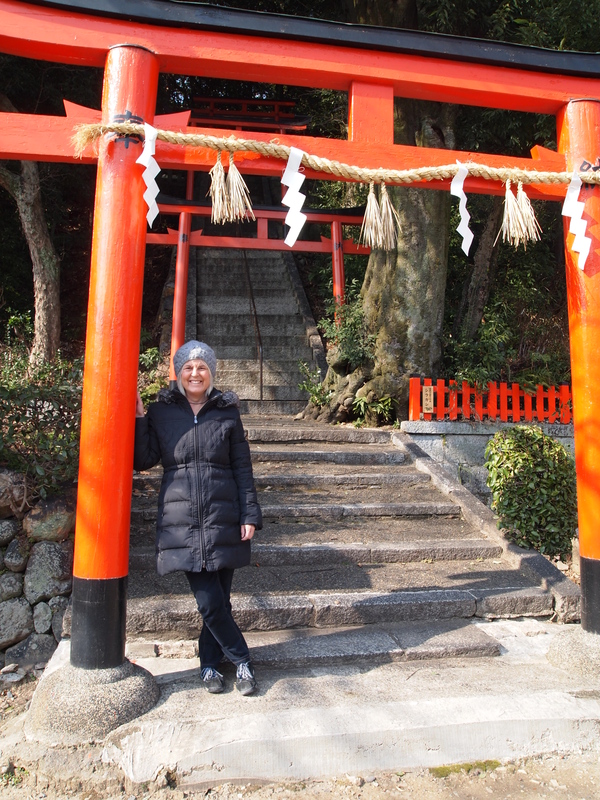 We venture off our yellow highlighted route quite accidentally early on and come upon the vermilion-colored gate of Takeisao Shrine, where we stop and take pictures of each other in our coats and wool hats. 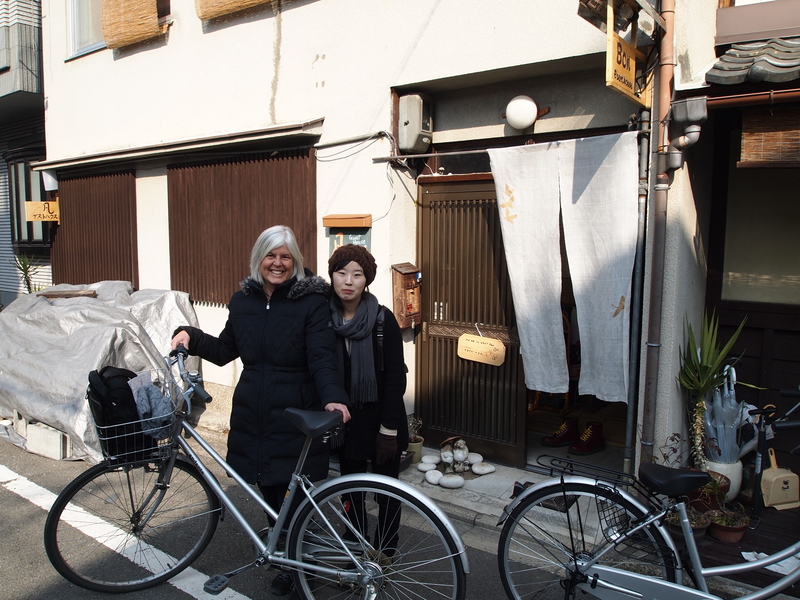 We cycle down sparsely traveled back streets, which are as immaculate as any street encountered in Kyoto. It doesn’t matter whether is a street is a busy thoroughfare or a narrow alley-like street. No trash or dirt is evident anywhere. The sidewalks are neatly swept and all trash is sequestered properly in its neatly secured rubbish bin. This is one thing in Japan that I find notably different from Korea. In Korea, at least in my neighborhood near Keimyung University, trash is always tossed haphazardly about on the streets. A person seeking to throw away trash can walk for blocks carrying this rubbish because trash bins are elusive things in Korea. After heading south from Bon Guesthouse, we cross west to east on the sidewalks of Imadegawa-dori Street. When we come to the northwest corner of a huge walled park, we know we have arrived at the Kyoto Imperial Park, home of the Kyoto Imperial Palace. JiYoung and I pedal along the north wall until we finally find an opening to this immense park. At this point we head toward the center where we try to go into the Kyoto Imperial Palace. However, we find it is required to reserve tours ahead of time and we are not allowed in unless we are part of a tour. Oh well. We hop on our bikes and head toward the far southeastern corner of the immense rectangular park, where we exit and ride straight down Teramachi-dori Street and then spend a great deal of time in front of Kyoto City Hall trying to figure out how to use the metered bike parking spots. Since we don’t speak any Japanese between us, and since the people we encounter on the street don’t speak English, we fumble about trying to make sense of the system. Finally we figure out that we must pick up our bikes by 5:00 or they will be locked in overnight. We also find, after unsuccessfully trying numerous times to pay BEFORE leaving our bikes, that we pay when we pick up our bikes, upon our return! Ah the challenges of being in a country when you speak not a lick of the language! 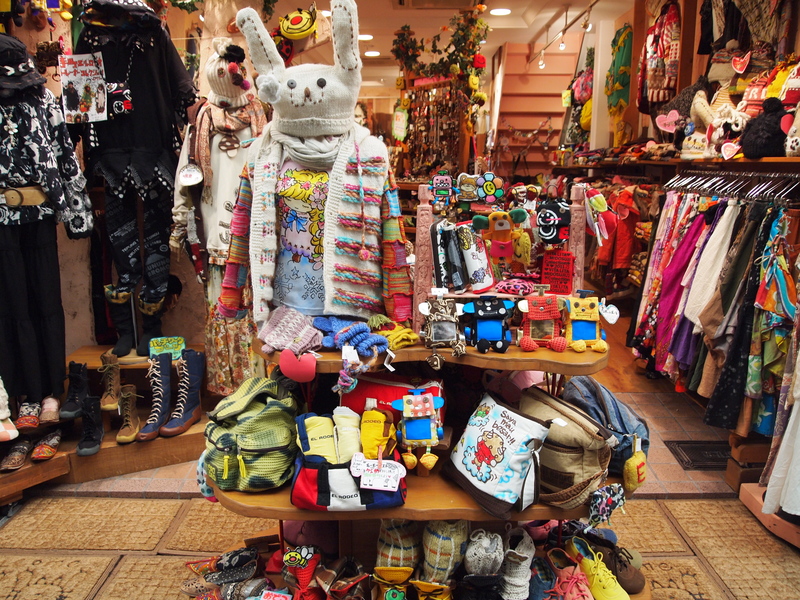 On Teramachi-dori Street, JiYoung and I are bowled over by the adorable shops. The import business is big in Kyoto, as each shop is bursting with cool things obviously brought from somewhere else, places like Tibet, China, India, Pakistan. Colorful and unusual items all offer themselves quite cheerily for sale. 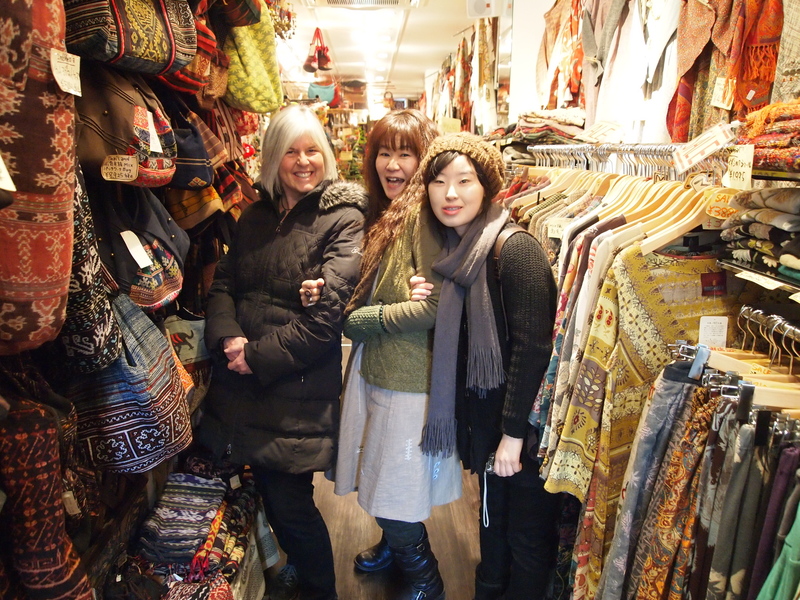 In one shop we spend quite a long time browsing, chatting with the hip Japanese owner, and buying scarves and what-nots. I always love a shopping day while traveling. In one shop I see a round red hand-painted globe lamp in a window that looks like it’s from India or some other cool exotic place. I inquire as to the price within, and I find it’s only $52 US!! I don’t think that’s bad for Japan, where everything is quite pricey. I obviously don’t want to carry it around all day, so I determine I will return to buy it before picking up my bicycle at 5:00. 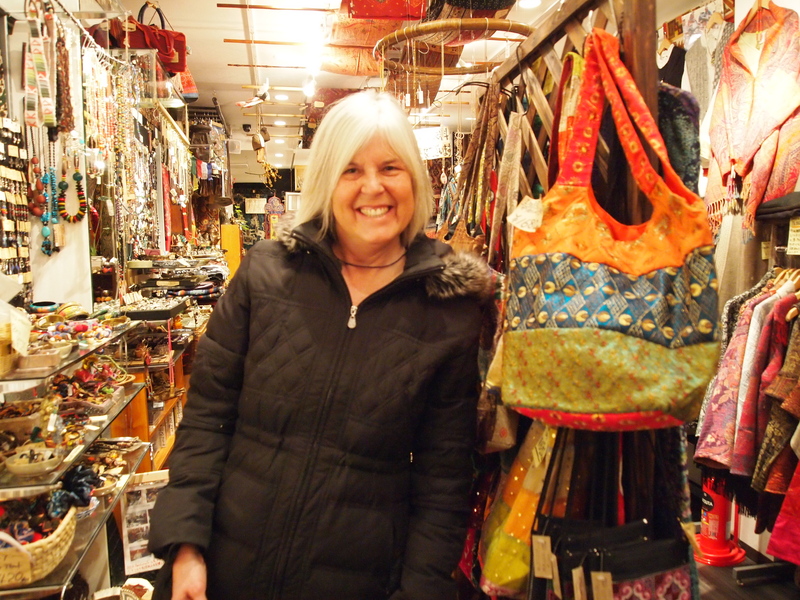 We poke into all kinds of shops looking at artsy books, hand painted Japanese kitty placemats and matted paintings, brightly colored change purses made of kimono fabric, giant stuffed rabbits wearing Hello Kitty t-shirts and woolens from Tibet. We dip into shrines to reverently watch people making offerings and praying for wishes to come true. 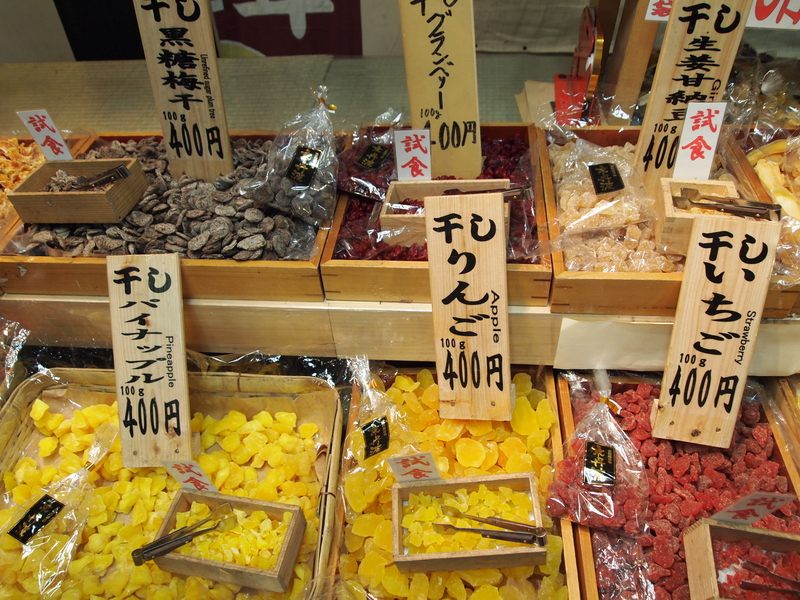 We turn then onto the Nishiki Food Market where we see a plethora of unusual foods I have never laid eyes on before. The food market itself is a piece of art, with every food lined up so its proportions and colors are set off to best advantage. The foods are simply all dolled up. Food items sit atop bushels or baskets or barrels filled with some grainy stuff. They’re identified with rectangular wooden signs bearing Japanese letters. Even the fish offerings are prettily displayed on hand-painted ceramic plates or trays and decorated with green garnishes. At one shop there are colorful dried fruits of every type imaginable from strawberries to pomegranates to kiwi to grapes, raspberries, bananas. We are allowed to sample all the kinds we want and I end up buying dried kiwi and strawberries. I want them all! 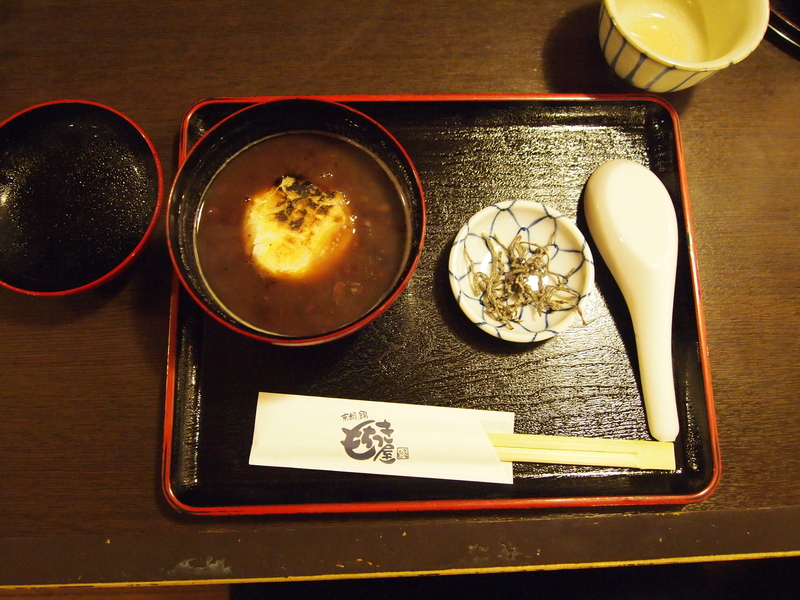 JiYoung and I stop at Japanese restaurant where we have tea and I have sweet red bean soup with millet cake. It’s interesting and delectable. 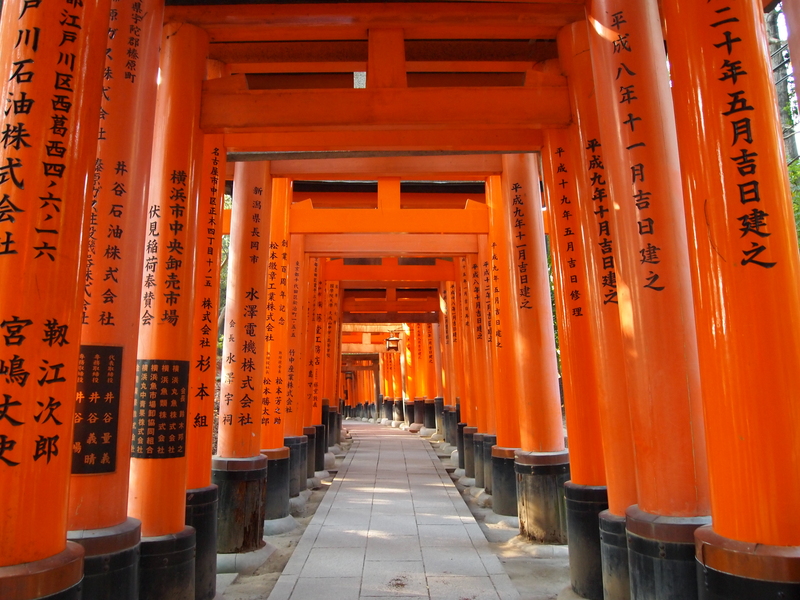 Then I tell JiYoung I have it in my mind, on this last day in Kyoto, to go to Fushimi-inari-taisha Shrine, home of the infinite torii gates. She doesn’t want to go because she wants to continue shopping in the arcade. So we agree I will take off and we will meet again at around 4:30, so we can retrieve our bicycles before they are locked in for the night. I’m a little worried about venturing to this place, because time is short and I don’t know the distances or the speed of the transportation. The commune owner warned me to please not let the bike get locked up overnight at city hall because it will be a hassle for him. I know I won’t have time in the morning to get it because I have to leave early to catch a bus to Nagoya, where my flight leaves for Korea. I take another overground train driven by a conductor in a little hat and white gloves. Cute little ditties play over the loudspeaker to announce stops. 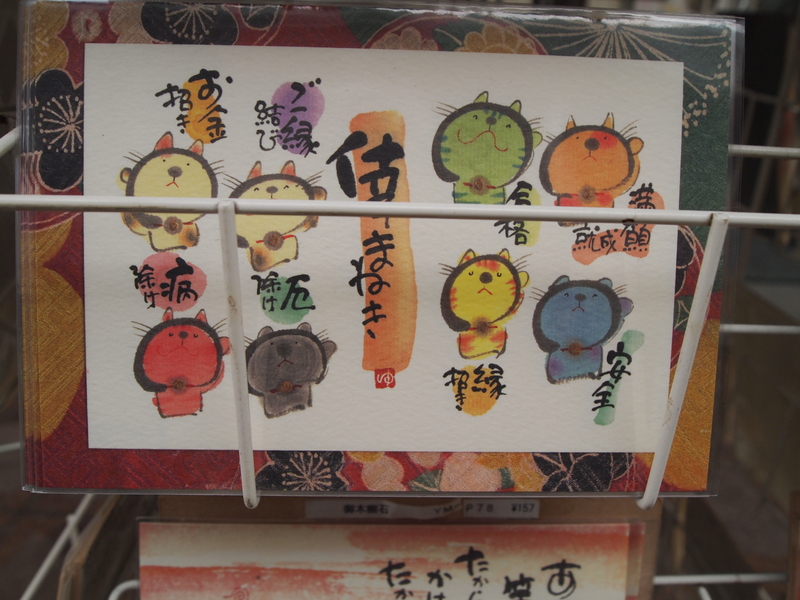 I am continually amused and tickled in Japan by how cute and quirky everything is. I approach the shrine and walk around the complex. The torii gates aren’t evident at first. Up some stairs, I finally come across the first tunnel of gates and stroll through the beams of sunlight cutting through the spaces. 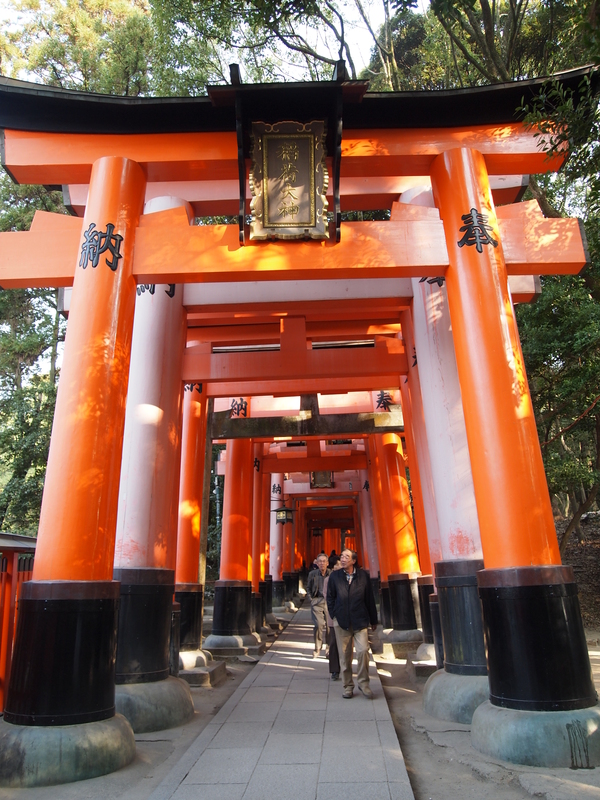 Fushimi-inari-taisha Shrine was dedicated to the gods of rice and sake in the 8th century. As agriculture’s importance declined, deities were assigned to ensure prosperity in business. 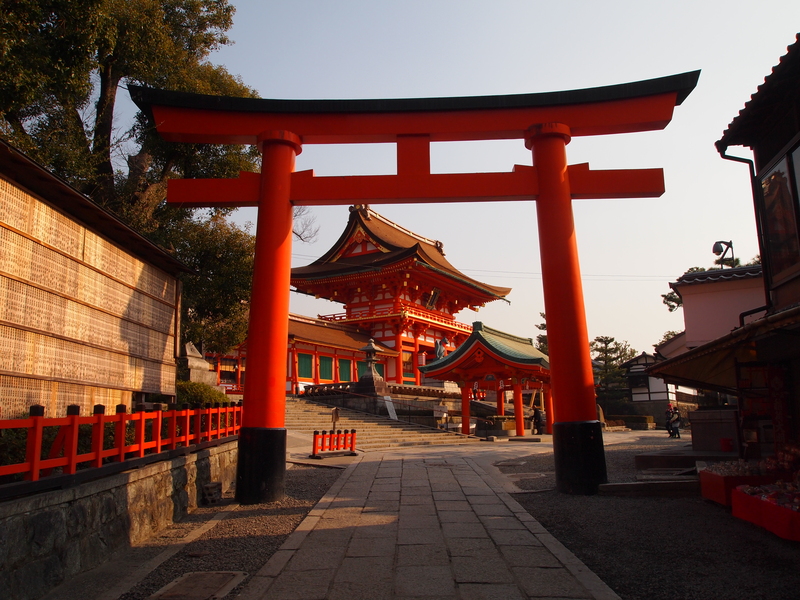 This is one of Japan’s most popular shrines, with these seemingly endless arcades of vermillion torii (shrine gates). The entire complex consists of 5 shrines and stretches over the wooded slopes of Inari-san. I take the 4km pathway up the mountain and it is lined with hundreds of red torii and stone foxes. The fox is believed to be the messenger of Inari, the god of cereals. Often a fox holds a key in its mouth that represents the key to the rice granary. I keep walking and walking, expecting to eventually come to the end of these tunnels of torii. As I have a time constraint, I cannot see it through to the end. I walk quite far up, but as I emerge from each tunnel of gates, I turn a corner only to find another tunnel stretching before me. I do this too many times to count and I keep looking at my watch to make sure I will have time to get back down the mountain and back on the train to City Hall. I go through a tunnel and think, surely this must be the end! And lo and behold, there is another. To me, it seems these torii are certainly infinite. I take the train back to Teramachi-dori Street, where I return to the shop to buy the red globe lamp. As I pay and the shop owners wrap it in bubble wrap, they tell me the lamp comes from Pakistan. I think, shoot, I should have waited till I got to India. It probably would have been much cheaper there! But… of course there is no guarantee I will see a lamp like this in India. I carry the cumbersome globe lamp, which the owners have fitted with a raffia handle contraption, to City Hall, where JiYoung is sitting there patiently waiting. I’m not really sure how long she’s been waiting there, but there is some indication she has been there a long time. I wonder why she didn’t just head back to the Bon Guesthouse without me. I think maybe she didn’t know how to get back without me to navigate, especially since I had the map. We pay our parking fee and retrieve our bikes and ride the long ride back, retracing our route from this morning. The whole time, my knee keeps hitting the globe lamp, which I have hung over my handle bars. 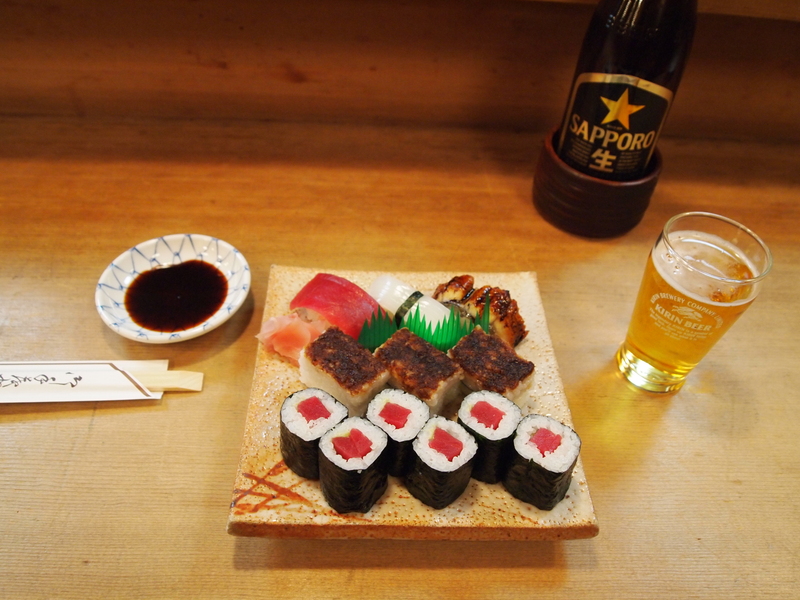 After getting back to the commune, I put away my lamp and walk down the shopping street to a small unmarked door which the commune owner has told me is a sushi restaurant. There, I am the only customer, and I have a halting and difficult conversation with the husband and wife owner. He is the sushi chef, that’s apparent, while she does the other stuff. They’re quite kind and friendly and I have a nice dinner in their cozy little restaurant. After dinner, I return to the Bon Guesthouse, where I turn on my little space heater for my last night, curl up on my floor bedding, and read some more of The Lady and the Monk before I drop off to sleep, exhausted from my bicycle ride through this lovely city. Saturday, February 5: In the morning, I take a bus at 9 a.m. from Kyoto to Nagoya, arriving in Nagoya at 11:40. I take a long train out of the city of Nagoya to Nagoya Chubu Centrair, where I check in at 1:00 for my 3:10 flight to Busan. By the time I arrive in Busan at 5:00, catch the bus back to Daegu and the subway back to my apartment, it’s nearly 8:00. So again, an entire day of travel to get just a few hours away from home. Ah, the travails of travel….